If you are still set on purchasing a pug puppy, please learn about the best place to find a puppy. Where not to buy a puppy? Any pet store and any ad in the paper. Both of these are only selling puppies for profit – and quite a profit they will make! All (yes, all) puppies in pet stores come from puppy mills in the Midwest. Even the $1500 pugs in the pet store in the mall, where they swear they come from “reputable breeders” in reality come from the puppy mills in the Midwest. Ask them to see the AKC papers and you will most probably see the breeders listed from MO, AR, OK or even PA. These are commercial kennels who only churn out puppy after puppy of all breeds and sell them to brokers for anywhere from $200 – $500 for the pet store to mark them up to $1500. What kind of guarantee will the pet store give you? 24 hours? What about genetic problems? The problems today with the pug breed, as it becomes more and more popular, is the genetic problems we are seeing bred down in the breed. The commercial kennels and even the back yard breeders don’t care about these problems. They don’t guarantee a puppy from genetic problems for life. A reputable breeder will. The pet stores will give you a year guarantee… but – they will only give you another puppy if something is wrong – not fix the puppy you may have already had for 3 – 6 months and become attached to! Backyard Breeders are typically people who have more than one breed of dog whom they breed litter after litter, sell the puppies at 6 – 7 weeks and don’t care who they sell to as long as they have the cash to pay for the dog. They may give a 24 hour health guarantee, which is nothing. They don’t care if two weeks from now your pug has health problems – they have their money and you have your unhealthy dog. They give no consideration which adults they are breeding. If one has a genetic problem, so be it, ‘not all the puppies will have it’. They are only in the dog business to make a quick buck. You will see these “breeders” advertised in the paper for $200 – $400. Kitchen Breeders are typically people who have a pure bred dog, maybe two, and think, ‘Hey, why not breed my dogs? There are so many people out there who want them.’ These are well meaning people who may not know any better. They may have gotten their first pug from a pet store – hence a puppy mill – and who knows what may be wrong with him/her. 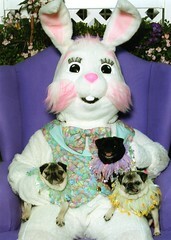 Genetic problems don’t show up until the pug is at least a year old if not 2 years old. By this time, the kitchen breeder has already bred his or her pug and the problems continue. If you run into an irresponsible breeder, please take down as much information as you can and call the Department of Agriculture at 404-656-4914 to report your findings and concerns. Responsible Breeders are breeders who care what genetics they are breeding down the line. They know exactly who the sire and dam are and their genetic make up for numerous previous generations . The dogs they have bred have been tested and certified for their eyes and hips. Not just looked at by a vet to say “he or she is healthy and looks good, go ahead and breed”. X-rays have been done for their hips and knees, testing has been done on their eyes to guarantee a healthy dog from genetic problems for the rest of it’s life. A pug puppy will be more expensive from a responsible breeder as they put more money into the puppies with the testing, lineage tracing etc. So…. how to find a reputable breeder? It’s not easy, and most have waiting list a year or so long. You can start with the Pug Dog Club of America Breeder Referral List or the Pug Dog Club Pug Clubs. When going to any breeder – remember, the breeder should interview you, the potential owner, not just holding the puppy out to you in one hand and getting your cash in the other. Now…. about rescuing a pug!! Yes, while we typically have a waiting list and we rarely get in puppies, rescue is still a great way to adopt a pug! When a pug comes into our care, everything is done to make sure they are healthy before they leave us. They will be spayed/neutered (even if they are puppies), current on their shots and heartworm negative before they leave us. Think about it, if you buy a puppy you then have to do all the above to your puppy, which is a tremendous amount of money. When you adopt from us – it’s done! Another thing to consider since most genetic problems show up between 6 months to 2 years, most of our pugs have been through this stage in their life already and should not have any genetic problems in the future. (The genetic problems I am referring to here are: Pug Dog Encephalitis, liver shunts, luxatting patella, and juvenile cataracts to name a few). Granted, we can never guarantee a pug for life, but with a puppy, especially from in irresponsible breeder, you are taking a risk when you purchase. While we do get the healthy, 2 year old housebroken females, we also get the 12 year olds dumped in the shelters. Another wonderful thing about pugs is – they adapt to new environments extremely well. With their “happy go lucky” attitude and their love for life and attention, they do very well in their new homes and will attach to the new family very quickly – even after a few days! If you are seriously interest in adopting an adult pug, please fill out an application to be put on our waiting list. When will you be able to adopt a pug? We have no idea when a pug may come in and while our list is not first come, first serve, we do look at applicants in a dated order and will call or email you immediately if a pug matches your application. Of course, if you only want a housebroken female under one year of age, you’re wait will be a lot longer. StyleWorks is an annual luncheon and fashion show benefitting Siskin Children’s Institute. This year’s fashion show included a pug! I almost fell out of my chair with excitement. Pugs on the Cat Walk! 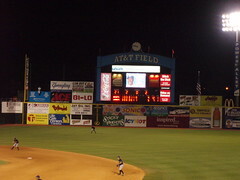 I am pretty sure that everyone who knows me knows that I am not a sports fan, but….Saturday, April 18th was the United Way volunteer night at the Lookouts. We missed the first pitch because I took a nap and woke up late, but the weather was perfect and we had a great night! If your heart’s in the right place, you understand the value of adopting rather than buying a pet. But what if that same heart is set on a particular breed? Despite what you might think, that’s no reason to give up on adoption, says Betsy Saul, founder of Petfinder.com. “People are surprised to hear 25 percent of pets in shelters are purebred,” she says. It may seem like the odds of finding a particular breed in a shelter are low — but the good news is that most breeds have specific groups devoted to their rescue. In fact, shelters often transfer purebreds to such groups to free up space in their own facilities. On Petfinder.com, you can search shelters and rescue groups by breed for 241 breeds of pet — for the most popular dog breeds, the numbers available nationwide are generally in the thousands. The American Kennel Club Web site lists rescue contacts for all but seven of their 161 recognized dog breeds. 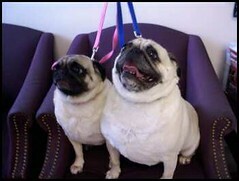 Matt and Alexandra Edwards of Alexandria, Va., were so happy with the Mid-Atlantic Pug Rescue group they used it twice. 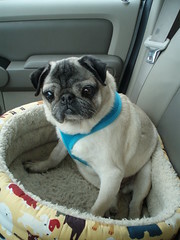 They wanted another dog when their pug Sophie seemed depressed after their first pug Max passed away. Potential owners often assume that rescue pets were given up because there’s something wrong with them, but Edwards is just as happy with his dogs as with the adoption process. Amy Lane, rescue chair of Mid-Atlantic Pug Rescue, says that the problems that land pets in shelters are generally with the owners, not the animals. “Sometimes it’s unavoidable; sometimes it’s people who just didn’t want to go the distance,” she says. Still, no dog is perfect, or perfect for every owner. The trick is to make the right match, and that’s why the process of adoption can seem a bit daunting at first. Rescue groups will generally have fairly substantial forms to fill out, require personal and vet references, and conduct phone and home interviews. It’s all designed to make sure that dogs find the right people and people find the right dogs. The first step for the rescue group is educating potential adopters about the breed. Many people don’t realize that pugs shed, for example, or that, while adult pugs are renowned couch potatoes, saying that you want a calm pug puppy is “an oxymoron of the worst kind,” says Lane. Because rescue groups see so many dogs surrendered, they know what causes problems and what makes a good match. And since most groups are all-volunteer and foster dogs in their own homes, someone has lived with your prospective pet and knows all about his habits and personality. One advantage of adopting an adult dog is that their personalities are more fully developed than a puppy’s, so you have a clearer idea of what you’re getting. But expect a process of getting accustomed to a new home; after six to eight weeks, you should be able to see what the chemistry between dogs and family members will be for the long term, says Lane. For dogs who have been neglected or had other troubles, there may be more changes for the better over time. One day to mix the ingredients then refrigerate over night. 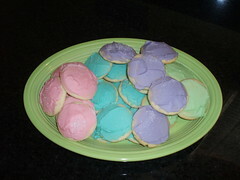 One day to bake and frost. Then one day to clean up all the sugar! It just goes to show that you never know who you will meet at the vet’s office. I thought that I knew every pug in town, but I met two adorable pugs today! Their names are Shelby (girl) and GT (boy); can you tell their dad is a Mustang fan? I guess that is the ‘man’ equivalency of naming your dogs ‘Thelma & Louise’! Starting on Tuesday April 7th Teddy was having problems standing on his front right leg, but I massaged it and stretched it out and he seemed better. He wasn’t completely standing on it and was kind of hobbling around when we got ready for bed. The following morning, he was just not walking right, but I could not put my finger on anything that was wrong. By Tuesday evening, I just felt that something was off so I made an appointment with the vet’s office. He would be standing up, but not all of his legs were connecting with the ground. He was also drinking and urinating excessively. Other than these things, he was acting normal. Thursday April 9th I took Teddy to the vet’s office bright and early for blood work and other tests. I had discussed with my vet the possibility that he’d had another stroke or they mentioned geriatric vestibular syndrome. We’ll wait for the results to come back. Saturday April 11th we went back to the vet’s office to get the lab results, which were elevated white cells that indicate an infection and he is loosing protein from his blood. We will start him on a round of antibiotics. They got a sterile urine sample and will do more blood tests to rule out some possibilities. He is still a little wobbly on his feet, which is probably not related to whatever is going on internally. His attitude is the same and he is acting normally. Well wait to see what these labs say. But after a morning of being poked and prodded, Teddy was just ready to get home and sleep! Chattanooga Pugs had our April play date at The Chew Chew Dog Park. It was a beautiful day, but had rained the night before so we had plenty of mud puddles for the pugs to jump into and get very dirty! You are currently browsing the papaspugs.com Blog blog archives for April, 2009.